Dr.Batcher is the simplest batch file editor available on market for batch programming. 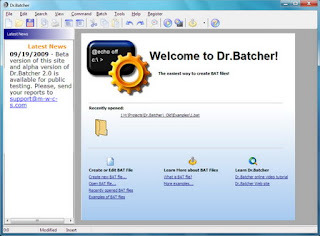 Using Dr.Batcher you can create batch file even if you have never done it before. If you know a lot about the creation of BAT and CMD files, Dr.Batcher is still useful for you. With Dr.Batcher you can use handy features of professional IDEs like syntax highlighting, code tooltips and bookmarks, that make writing code of batch file easier. Dr.Batcher really helps you to create bat files in easy and fast way!